The title of Shigeyuki Kihara’s upcoming exhibition is lifted from a large-scale painting by Paul Gauguin completed in 1897, shortly before he died in Tahiti. Kihara uses these questions to frame her examination of Samoan culture and society following the tsunami of 2009, last year’s celebration of the 50th anniversary of Samoa’s independence and most recently, the destruction caused by Cyclone Evan. 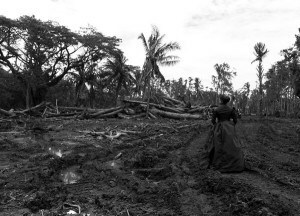 Taking inspiration from a late 19th-century photograph, “Samoan Half Caste”, by New Zealand photographer Thomas Andrew, Kihara dons a Victorian mourning dress and re-visits a character first seen in her performance works Taualuga: The Last Dance (2006); Siva in Motion (2012) and Galu Afi: Waves of Fire (2012). Referencing the staged photographic postcards of the ‘South Seas’, Kihara’s lone figure stands as silent witness to scenes of political, historical and cultural importance in present-day Samoa. She turns the camera on her country’s colonial past, the impact of burgeoning globalisation, ideas of indigeneity and the role of government in an independent Samoa. Kihara “unpacks the myth” of her country as an untouched Pacific paradise as seen through the eyes of colonial powers and tourist photographs. Kihara’s solo exhibition will be accompanied by reproductions of selected archival photographs taken by Alfred Burton in Samoa in 1884 and sourced from the University of Otago Hocken Library. Image: ‘After Cyclone Evan, Lelata.’ Courtesy of Milford Galleries and Shigeyuki Kihara Studios. Funded by Creative New Zealand.